Since 1997, Diamon-Fusion International (DFI) has been making people's lives easier and more beautiful by developing, manufacturing and distributing protective coatings, application machinery, and restoration products for architectural and transportation surfaces such as glass, granite, tile, porcelain and quartz. In this one hour course, we will evaluate hydrophobic coatings as a solution for many common problems encountered during the life-cycle of a building. 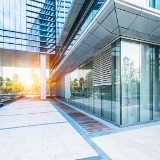 Some of the easily recognized benefits of a protective coating include a decrease in environmental damage to exterior glazing, significant reduction in building maintenance, improved photovoltaic performance, and enhancement of the forward-facing aesthetics. Additionally, we will explore a variety of applications, from shower enclosures to exterior glazing, while simultaneously explaining the operational, environmental and inherent benefits to this technology. The course will conclude with an evaluation of how hydrophobic coatings can help the building achieve LEED v4 certification. Describe the environmental benefits of hydrophobic coatings. List the operational impacts for building exteriors treated with hydrophobic coatings. Assess how the use of hydrophobic coatings can contribute to points in the LEED v4 rating system. Identify problems resulting from environmental damage to glazing.